Not to be confused with United States Senate election in Pennsylvania, 1909. 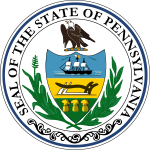 The 1909 United States Senate special election in Pennsylvania was held on March 16, 1909. George T. Oliver was elected by the Pennsylvania General Assembly to the United States Senate. Republican Philander C. Knox was appointed to the United States Senate in June 1904 after the death of Matthew Quay. Knox was subsequently elected to a full term in the Senate by the Pennsylvania General Assembly, consisting of the House of Representatives and the Senate, in January 1905. Knox served in the U.S. Senate until his resignation on March 4, 1909, to become United States Secretary of State in the William Howard Taft administration, leaving the seat vacant until a successor was elected. This page was last edited on 15 December 2018, at 23:08 (UTC).